Hey guys! 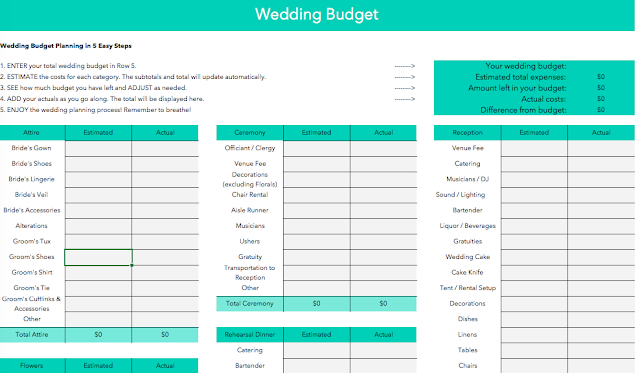 This week I am going to talk about budgeting for your wedding. If you missed the last weeks posts, I linked them above for you so you can catch up! Weddings can be SUPER pricey, so the best way to make sure you're staying on track and not overspending is to make a budget early on. This is the template I have been using. Linked here. It includes pretty much everything you'll need and you can always add more rows if you need since its an excel spreadsheet! But before you go filling in the spreadsheet, check out this form that will help you decided who pays for what and what percentage things are! You can find this here. Obviously this is just how things traditionally are. You can always tailor it to fit what exactly you want on the big day! For me personally, I'll probably be spending quite a bit more on flowers because I LOVE peonies, but they are SO expensive. This weeks post was kind of short and to the point, but its pretty simple. Your budget will really just depend on what you're specifically wanting and how much you are willing to spend. You can follow along with me daily on my wedding planning and progress by following my Pinterest board here! Next week we'll be talking about ways to save money at your wedding so check back for more! I LOVE a good deal, and this Spring I have searched and found AMAZING dupes on alllllll of the most popular shoes for Spring. Cute shoes can make or break an outfit- but I hate spending an arm and a leg on them. . .Can I get an AMEN? Hahaha. So I usually end up waiting until they go on sale. But by then, my size is usually sold out ( I am a 7, literally the most common size EVER) or it's not even warm enough out to wear them. So I end up tucking them away for next year, begging for the warm weather to hit. I mean, who wants to do that?? So instead this year, go with a good dupe that could be literally only 25% of the price!! I have linked both designer and dupe brand so you can shop either, just click on a image to shop! Y'all!! Easter is almost here. 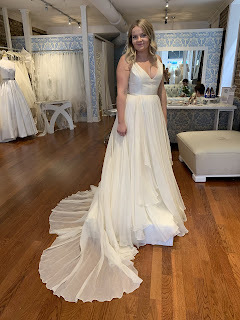 Do you have your dress yet?? I have bought 3 already that I LOVE. Good thing Caleb and I have several houses to visit! Maybe I'll just change each time we go to another house 😂 But really, I remember when I was little and I always looked for an excuse to buy another dress or outfit. "Mom, I need this for Easter!" She would never let me get things way in advance because she knew I would change my mind- I have always been the worst for that. Anyways, I hope y'all find your perfect dress and some outfit inspo for Easter! I am soooo excited to start planning my wedding! I have literally been planning this for years (thanks Pinterest) lol. 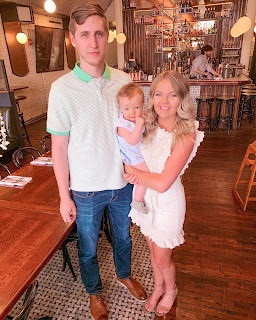 Although not everything has gone according to plan, I am so excited for this new part of our lives! That being said, your girl is STRESSED. Omg there is so much to plan and find! Any tips or recommendations would also be greatly appreciated!